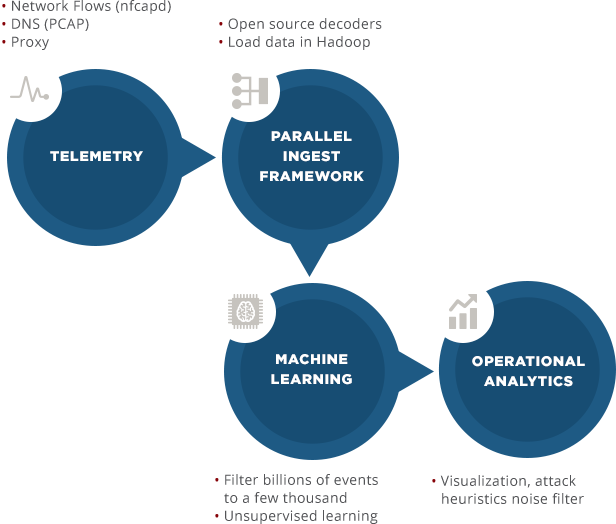 Apache Spot is open source software for leveraging insights from flow and packet analysis. It helps enterprises and service providers gain insight on their network environments through transparency of service delivery and identification of potential security threats or attacks happening among resources operating at cloud scale. While current threat intelligence tools help, identifying unknown threats and attacks remains a challenge. Apache Spot provides tools to accelerate companies’ ability to expose suspicious connections and previously unseen attacks using flow and packet analysis technologies. Apache Spot (incubating) is a solution built to leverage strong technology in both "big data" and scientific computing disciplines. While the solution solves problems end-to-end, components may be leveraged individually or integrated into other solutions. All components can output data in CSV format, maximizing interoperability. With the arrival of big data platforms, security organizations can now make data-driven decisions about how they protect their assets. Records of network traffic, captured as network flows, are often stored and analyzed for use in network management. An organization can use this same information to gain insight into what channels corporate information flows through. By taking into account additional context such as prevalent attacks and key protocols to the organization, the security team can develop a strategy that applies the right amount of per-channel risk mitigation based on the value of the data flowing through it. For an organization, we call this "the port perspective". While inspecting specific, unique flows of data that may be important for individual organizations, all organizations can realize significant risk reduction from analysis of network flows and DNS (domain name service) replies. Apache Spot by leveraging strong technology in both Big Data and Scientific Computing disciplines is a solution intended to support this strategy by focusing on “hard security problems” detecting events such as lateral movement, side-channel data escapes, insider issues, or stealthy behavior in general. Filter billion of events to a few thousands.